Chertanovo Severnoye District (Russian: райо́н Черта́ново Се́верное) is a territorial division (a district, or raion) in Southern Administrative Okrug, one of the 125 in the federal city of Moscow, Russia. It is located in the south of the federal city. The area of the district is 5.4015 square kilometers (2.0855 sq mi). As of the 2010 Census, the total population of the district was 111,875. 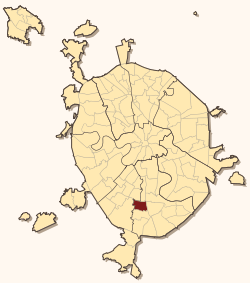 As a municipal division, the district is incorporated as Chertanovo Severnoye Municipal Okrug. 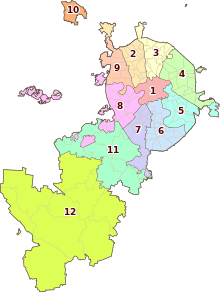 1 2 3 Russian Federal State Statistics Service (2011). "Всероссийская перепись населения 2010 года. Том 1" [2010 All-Russian Population Census, vol. 1]. Всероссийская перепись населения 2010 года (2010 All-Russia Population Census) (in Russian). Federal State Statistics Service. Retrieved June 29, 2012. ↑ The value of density was calculated automatically by dividing the 2010 Census population by the area specified in the infobox. Please note that this value is only approximate as the area specified in the infobox does not necessarily correspond to the area of the entity proper or is reported for the same year as the population. Московская городская Дума. Закон №13-47 от 5 июля 1995 г. «О территориальном делении города Москвы», в ред. Закона №38 от 26 июня 2013 г. «О внесении изменений в статью 4 Закона города Москвы от 5 июля 1995 г. №13-47 "О территориальном делении города Москвы" и Закон города Москвы от 15 октября 2003 года №59 "О наименованиях и границах внутригородских муниципальных образований в городе Москве"». Вступил в силу с момента опубликования. Опубликован: "Вестник Мэрии Москвы", №14, июль 1995. (Moscow City Duma. Law #13-47 of July 5, 1995 On the Territorial Division of the City of Moscow, as amended by the Law #38 of June 26, 2013 On Amending Article 4 of the Law of the City of Moscow of July 5, 1995 #13-47 "On the Territorial Division of the City of Moscow" and the Law of the City of Moscow of October 15, 2003 #59 "On the Names and Borders of the Internal Municipal Formations in the City of Moscow". Effective as of the moment of publication.). Московская городская Дума. Закон №59 от 15 октября 2003 г. «О наименованиях и границах внутригородских муниципальных образований в городе Москве», в ред. Закона №38 от 26 июня 2013 г. «О внесении изменений в статью 4 Закона города Москвы от 5 июля 1995 г. №13-47 "О территориальном делении города Москвы" и Закон города Москвы от 15 октября 2003 года №59 "О наименованиях и границах внутригородских муниципальных образований в городе Москве"». Вступил в силу через 10 дней после официального опубликования (16 ноября 2003 г.). Опубликован: "Вестник Мэра и Правительства Москвы", №64, 5 ноября 2013 г. (Moscow City Duma. Law #59 of October 15, 2003 On the Names and Borders of the Internal Municipal Formations in the City of Moscow, as amended by the Law #38 of June 26, 2013 On Amending Article 4 of the Law of the City of Moscow of July 5, 1995 #13-47 "On the Territorial Division of the City of Moscow" and the Law of the City of Moscow of October 15, 2003 #59 "On the Names and Borders of the Internal Municipal Formations in the City of Moscow". Effective as of the day which is 10 days after the official publication (November 16, 2003).). This article is issued from Wikipedia - version of the 6/16/2015. The text is available under the Creative Commons Attribution/Share Alike but additional terms may apply for the media files.